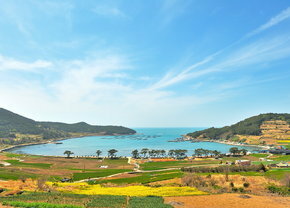 Cheongsando is an island farthest in the archipelago 19.2km from Jeonnam Wando. It is in 50 minute distance by boat from Wando port. With particularly beautiful scenery, it was also referred to as Cheongsanyeosu or Seonsan and Seonwon for its beauty comparable to Taoist hermits. Cheongsando, with slow scenery of blue sea, blue mountains, flat rice field, stone walls and haenyeo and the traditional culture of island mingling together, was recognized for its value internationally. On 23 December 1981, it was designated as archipelago maritime national park, and on 1 December 2007, it was designated as the first Slow City in Asia. Small Island Named Cheongsan with blue mountains, sea and sky! Cheongsando Slow Trail is an old path for Cheongsando residents between villages. It was named slow trail as your steps will get slower by the beautiful scenery. The total 11 courses (17 trails) of up to 42,195 km were opened in 2010. The trails have the biggest characteristic of forming each course to mingle the scenery of trail with the story on the trail. It was designated as the ecological trail with stories in 2010 by Ministry of Culture, Sports and Tourism, and after being designated in 2011 as the first global slow trail officially certified by International Slow City Association, its beauty was reknowned worldwide. 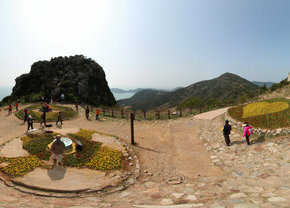 Beombawi, a view point for Cheongsando in a glance, is also famous for powerful spirit. his phenomenon is also famous for the Bermuda Triangle and the Iron Bottom Sound where ships passing will disfunction after the compasses rotate round and round leading to sea accidents. 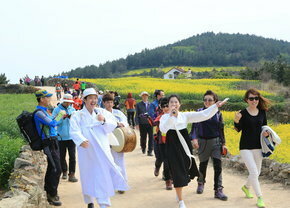 Hence, many tourists are visiting Cheongsando Beombawi to get the strong spirit. Try and look for the shape of a tiger from Beombawi, named after the crouching of a tiger or the sound of a tiger whenever wind passes the gap between rocks.